Manufacturing PMI stood at 46.5 in June, singling sharp rate of contraction that was somewhat slower than the decline in May (45.9). Per Markit, "new orders and output both drop at sharp rates; inflationary pressures ease." June PMI was the highest in four months and marks the fifth consecutive month of sub-50 readings. 3mo average is now at 46.1 against 3mo average through March at 48.8 and 3mo average through June 2014 at 48.9. Services PMI also came in at disappointing levels, falling to an abysmally low 39.9 in June from already low 42.5 in May. This marks the lowest reading in Services PMI since March 2009 and the second lowest reading in Services PMI in history. As noted by Markit, "Private sector jobs cut at quickest pace for over six years; Steep, but slower, contraction in new orders received by private sector firms." With 4th consecutive month of sub-50 readings, services PMI averaged 42.3 in 3mo period through June 2015, compared to 49.5 average for the 3mo period through March 2015 and 50.8 for the 3mo average through June 2014. 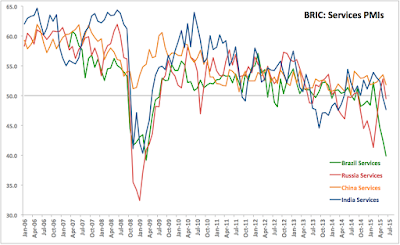 Overall, "Brazil’s private sector economy registered its sharpest retreat since March 2009. Down from 42.9 in May to 41.0 in June, the Composite Output Index was indicative of a steep drop in activity, with sharp falls seen at both service providers and manufacturers." 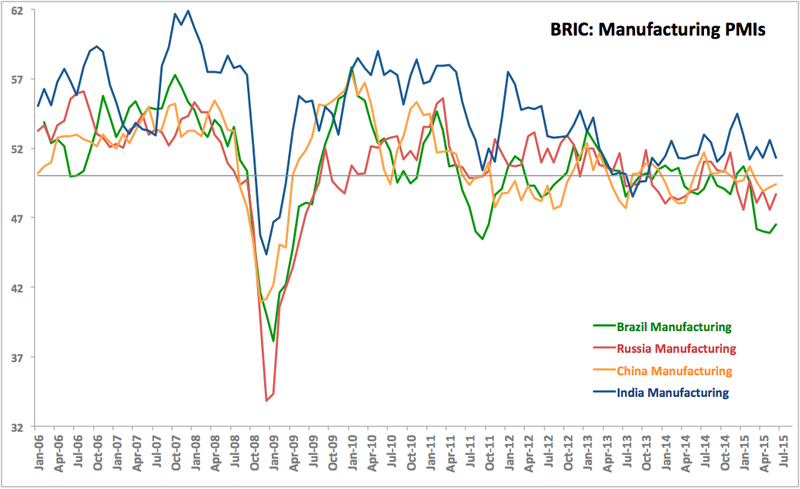 Russian PMIs are covered in detail here: http://trueeconomics.blogspot.com/2015/07/4715-russia-services-and-manufacturing.html?spref=tw and summarised below in the table. India's Manufacturing PMI came in at 51.3, signalling weak-to-moderate expansion of manufacturing output and down from 53.5 in May. On a 3mo average basis, June 2015 PMI was at 51.7 - marginally slower than 3mo average of 52.1 for the period January-March 2015 and slightly ahead of 51.4 3mo average registered through June 2014. Markit noted that June figures presented the "slowest rise in new work since September 2014; Negligible increases in input costs and output charges." On Services PMI side, June reading of 47.7 marks second consecutive month of sub-50 readings and a sharpening in the downturn from 49.6 in May 2015. 3mo average through June 2015 is now at 49.9 against 3mo average through March 2015 of 53.1 and 3mo average through June 2014 at 51.0. Services PMI is now sitting at the lowest level since March 2014. Per Markit: "Falling to 49.2, from 51.2 In May, the seasonally adjusted Nikkei India Composite PMI Output Index recorded below the crucial 50.0 threshold for the first time since April 2014. Reductions in activity were centred at service providers, as manufacturing production rose during the month." HSBC Purchasing Managers’ Index for manufacturing posted at 49.4 in June. This was the fourth successive, marginally up on 49.2 in May. This marks 4th consecutive month of Chinese manufacturing PMI readings below 50. Per Markit release, "Output contracts at slower pace as new orders show signs of revival" but "Staff numbers are cut at sharpest rate since February 2009." 3mo average through June 2015 was 49.2 down from 3mo average for 1Q 2015 AT 50.0 and lower than 49.4 3mo average through 2Q 2014. On services side, PMI posted a significant "moderation in the rate of service sector activity growth. Moreover, it was the slowest expansion in services business activity since January, as signalled by the HSBC China Services Business Activity Index posting 51.8, down from May’s eight-month high of 53.5." However, 3mo average for services was at 52.7 in June 2015, compared to 52.0 in 3mo period through March 2015 and 51.7 for the 3mo average through June 2014. "HSBC China Composite PMI™ data (which covers both manufacturing and services) pointed to a further rise in total business activity in China during June. However, the rate of expansion eased to a marginal pace that was the slowest recorded since May 2014. This was signalled by the HSBC Composite Index posting only slightly above the neutral 50.0 mark at 50.6 in June, down from 51.2 in May." India is running negative growth in Services. 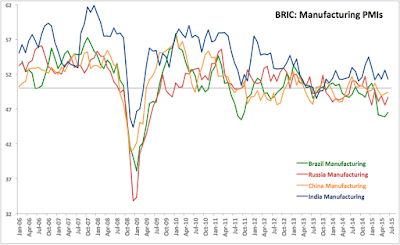 This contrasts with 1Q 2015 when Brazil and Russia were posting negative growth across both Services and Manufacturing, while India and China were posting positive growth across both sectors. Stay tuned for composite analysis and summary next.